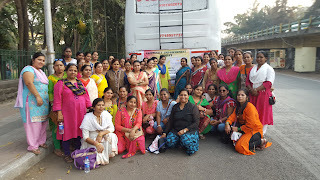 3-Feb-2018, Mumbai: The Don Bosco Development Society (DBDS), Mumbai organised an exposure visit to Micro Business Enterprises in Pune for the Self-Help Group (SHG) women residing in the slums Mumbai. 50 women from different SHGs participated in the exposure visit was held under the aegis of project supported by Don Bosco Mondo, Germany. The purpose of this exposure visit was to give an opportunity to women to practically experience the working, operations and functioning of a small business by interacting and speaking to the entrepreneurs. The first visit was to ‘Lavanya Masale’ located in Transport Nagar in Nigadi (Pune). Lavanya Masale is into spice making and selling business. This business was started by a SHG and they manufacture all types of spices (masalas). Their business is extended over India and also in abroad. 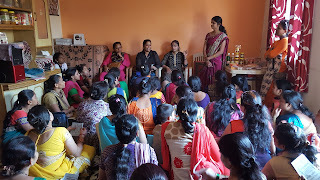 Mrs. Pooja Prakash Waychal (Proprietor- Lavanya Masale) explained to the participants, how they as a group came together to start this business, which is now running successfully. 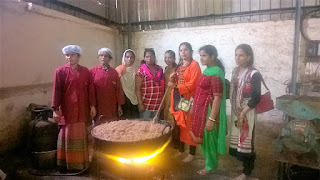 The participants also visited the factory where the spices were actually prepared and were able to witness how different types of spices are prepared. Next visit was to ‘Ruchi Food Products’ which is located in Lohegaon (Pune). It is also a small business started by SHG women. They produce different types of papad, pickle, juices, sweets, etc. During the visits, the participants were very curious and they asked lots of questions regarding the business which were all answered by their proprietor. The participants were very much fascinated and thrilled by the visit and most of them are very excited to start a small business. 3 DBDS Staff and the Project Officer also accompanied the SHG women during the exposure visit. After the visit Lunch was served to all at DBDS, Koregaon Park.